Alain Bensoussan and Hatim El Khatib, respectively French and Moroccan member of the Lexing network, participated in the awards ceremony on 16 March 2017. 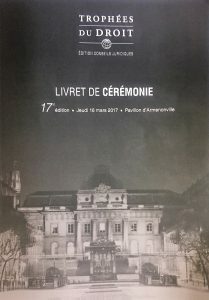 On March 16, 2017, the 17th edition of the Trophées du Droit ceremony (Pavillon d’Armenonville) was held during a gala dinner, attended by more than 1,000 legal professionals, executives of law firms, Institutions, professional associations and legal and tax departments. Three categories of professionals have been distinguished and rewarded: the best international law firms, the best specialized teams and the best managers of law firms. Alain Bensoussan Avocats Lexing received the 2017 Gold Trophy in the category New technologies: Computer science, Internet / Personal data and Telecommunications. The Elkhatib Law Firm, represented by our colleague Hatim El Khatib, a member of the Lexing network, was nominated in the category Best Law Firm: North Africa – Morocco.